Dashing by on my way to meet a friend at St James Park just as the Changing of the Guards ceremony was about to start. If you're wanting to catch this event take it in at Horse Guards Parade rather the Buckingham Palace for a better view and smaller crowds. They look so smart in their uniform! Those bright capes do stand out! Hey, no café here today? Thanks for your visit to Avignon! Great photo, of the "Changing of the Guards"! 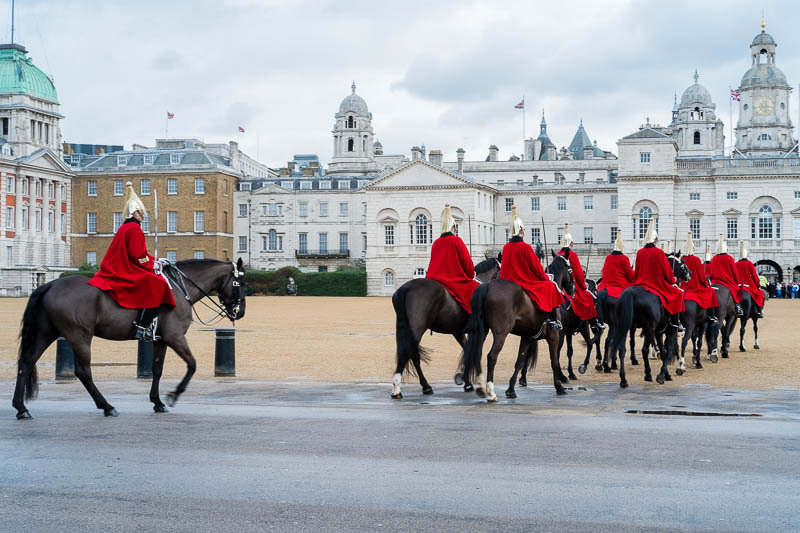 Do you know that in all the times I've been to London I've never seen the changing of the guards. I've seen the band getting ready and I did see the parade down the street when I was riding in that wonderful little car with you, but never the ceremony. Since ours is derived from the British tradition, the ceremony would be quite similar, though ours is only in summer.